Welcome to Rostrevor Cottage for country style bed and breakfast accommodation near Kyneton. Welcome to Rostrevor Cottage – for country style bed and breakfast accommodation near Kyneton. Rostrevor Cottage is a self-contained bed and breakfast close to Kyneton and set on three very private acres with magnificent views across Drummond, Kyneton and the Macedon Ranges. Our Kyneton Accommodation offers you exclusive use of the cottage, peace and serenity for a very relaxing stay and we are only a short ten minutes drive to Kyneton’s historic Piper Street, famous for its fine dining and shopping. 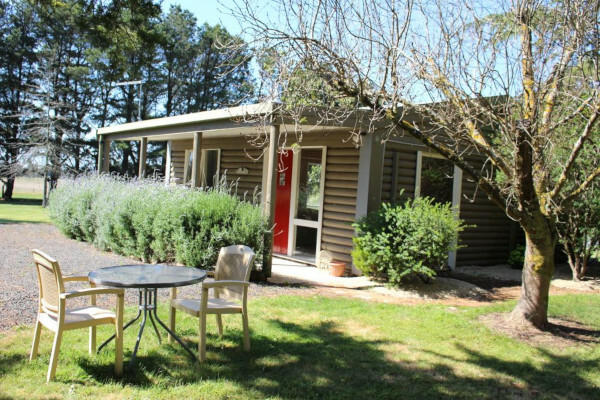 While Kyneton is very close to Drummond, our bed and breakfast accommodation is also a very easy drive to nearby Castlemaine, Trentham or Daylesford and we are just minutes from the hamlet of Malmsbury. Self-contained cottage with private access. Our log cabin bed and breakfast cottage provides accommodation for one couple and is a light-filled open plan cottage with en-suite and fully equipped kitchen. There is a very cosy wood fire for those chilly winter nights and a reverse cycle air conditioner plus a ceiling fan which makes Rostrevor Cottage very comfortable for all seasons. Breakfast has many options for you to choose from, you may wish to visit one of the many cafes in Kyneton or enjoy a continental breakfast (additional cost of $20 per couple and if required please request when booking) or bring your own provisions, cook a hearty breakfast, set a table under a shady tree and enjoy! 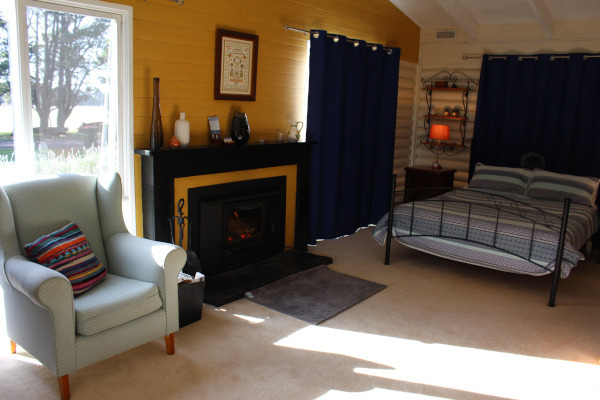 Whether you are looking for overnight accommodation or a longer stay, we hope that you find the time to enjoy the peaceful relaxation that our self-contained B&B offers while still enjoying all that nearby Kyneton and the Macedon Ranges has to offer. 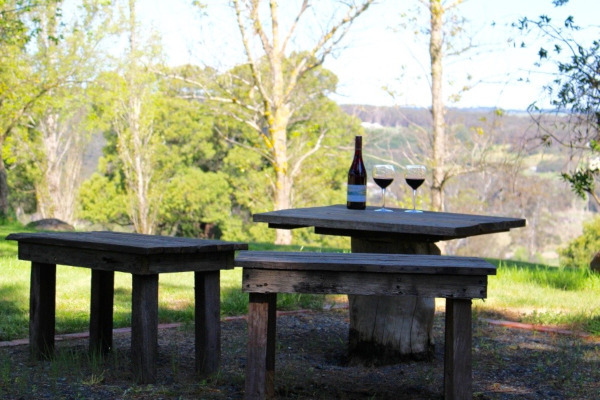 There are local wineries to visit just minutes away, lovely walks to take along the Campaspe River and Malmsbury lake, fishing to be tried at Lauriston or Malsmbury Reservoirs and of course, shopping and fine dining in nearby Kyneton, Castlemaine or Daylesford. The options are endless! With exclusive use of the cottage we are sure you will enjoy the privacy and peacefulness of Rostrevor cottage.